The cast and crew have already taken up residence, filming over the coming weeks on location and in the BBC's Dumbarton Studios, outside Glasgow, with the series expected on screen in early 2019. 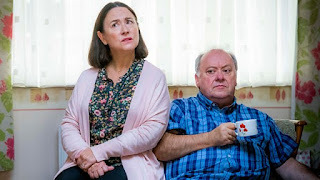 Set in the fictional Scottish suburban street of Latimer Crescent, this new six-part series will once again have its core cast, with Arabella Weir as Beth and Alex Norton as Eric - the long-suffering Bairds whose home is often at the heart of the comedy - and Elaine C Smith as Christine, Doon Mackichan as Cathy and Jonathan Watson as her husband Colin, Jamie Quinn as the Bairds' son Ian and Kieran Hodgson returning as his boyfriend Gordon. Having been introduced in the last episode of series three, Graeme 'Grado' Stevely and Joy McAvoy will also be back as new neighbours Alan and Michelle, settling in to their freshly decorated house. This new series will see Beth and Eric celebrate 30 years of married bliss, while Christine will stress test the NHS with a temporary hospital stay, and the Bairds will receive a visit from Gordon's parents Sandra and Graham, played by Maggie O'Neill (Shameless, EastEnders) and Alex Kirk (Bad Move). There's a whole new level of passive aggressive tension unleashed as Cathy jealously vies with new neighbour and rival Michelle. BBC Two re-commissioned Two Doors Down, in the wake of the successful third series when it received plaudits from critics and public alike, becoming one of the channel's top performing comedies of 2018 and winning the Best Comedy award at the 2017 Royal Television Society Scotland Awards. Arabella Weir says: "The whole cast were thrilled at the very warm reception series three received across the UK. And for my part I'm over the moon to be pulling on Beth's leggings again." Doon Mackichan says: "Cathy, as ever, will have a few surprises in her wardrobe and will deliver even more surprises in her neighbours' living rooms. Series four is going to be fun."